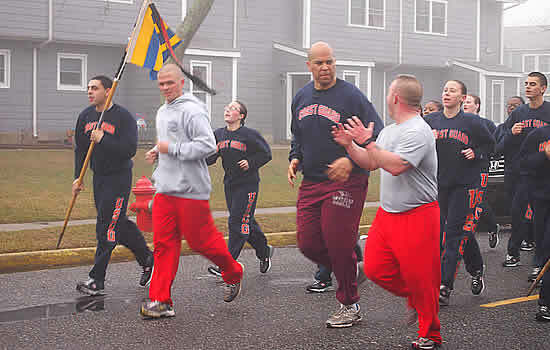 Coast Guardsmen at Training Center Cape May, N.J., got a high-profile visit Saturday morning. But it didn’t mean they could skip a workout. Booker’s dead last on the Senate’s seniority list, but that (and his acting skill) aside, there are worse friends the Coast Guard could make: The junior senator is on the Senate Commerce Committee subpanel that deals with the Coast Guard, was a national political darling before winning a special Senate election last year, has at least a few high-profile connections and boasts nearly 1.5 million Twitter followers. The visit was part of a wide-ranging Cape May tour that included stops at the Coast Guard facility and other high-profile local destinations. Senators aren’t regular visitors to the popular vacation spot — one official told The Cape May Times that the last ones came from former Sen. Bill Bradley, who made annual treks during a legislative career that ended in 1997. Head to The Cape May Times website for more photos and details — those familiar with the region might want this song playing in the background. Get a TV report, including brief interview clips with Booker and training center commanding officer Capt. Todd Prestidge, here. Wow, what a bunch of fat bodies. Those coasties in the background look like they are about to pass out. 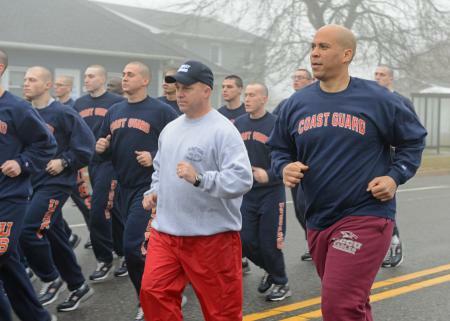 Neither Booker nor Capt Prestige look like they could pass a PT test. They need to work out more often and get rid of the life ring around their waists.